and the Foundation which bears his name. We have a wealth of information in the form of articles, video, audio, posters and other documents available in our Resources section. A separate picture gallery site is also available. You can find us in Edinburgh, in the house of James Clerk Maxwell’s birth (visitors welcome by appointment), and here on-line. Let us share our enthusiasm with you! A new panoramic virtual tour of James Clerk Maxwell’s Birthplace is now available. This allows viewers to see inside the restored house and view the exhibits at their own pace. 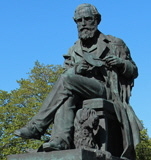 other cultural references to James Clerk Maxwell. 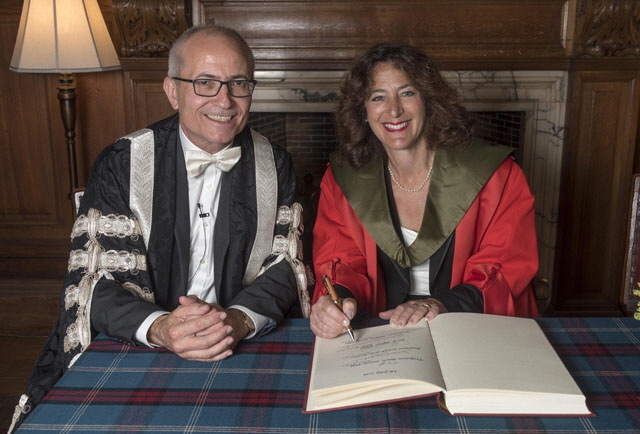 One of the James Clerk Maxwell Foundation distinguished visitors in July 2018 was Andrea Goldsmith, pioneering wireless Professor from Stanford University, on the occasion of the award of her first honorary degree from the University of Edinburgh, shown here with Senior Vice Principal Charlie Jeffery. photo courtesy University of Edinburgh. 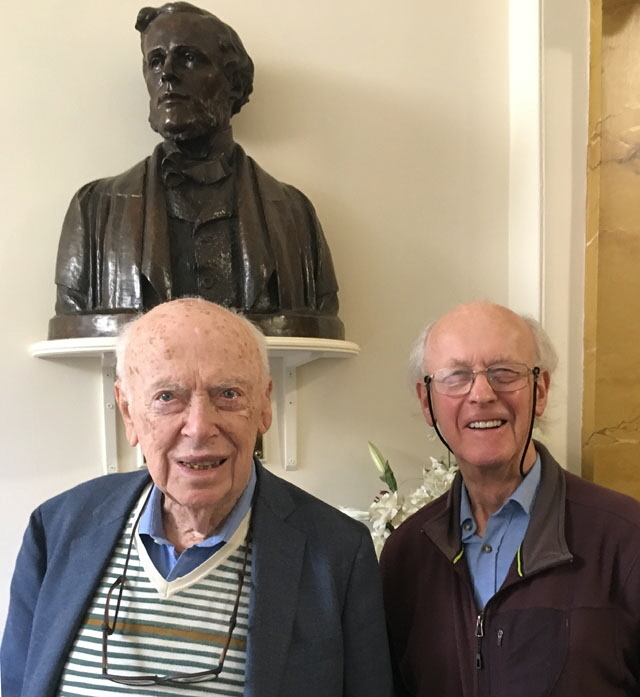 Distinguished museum visitors Thomas Haug and behind him Philippe Dupuis, pioneers in early Cellular telephony, who received the 2018 IEEE/RSE James Clerk Maxwell medal from HRH Prince William. Philippe donated, to the Foundation, his original 1987 GSM signed collaboration agreement. 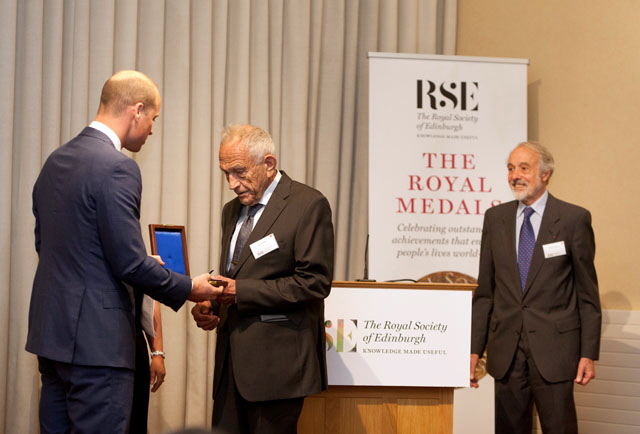 photo ‘Courtesy of the RSE: ©Gary Doak photography’. The James Clerk Maxwell Foundation (Registered Charity SC015003) was formed in Scotland in 1977 to honour one of the greatest scientists who has ever lived: James Clerk Maxwell. In 1993 the Foundation acquired James Clerk Maxwell's birthplace in Edinburgh (see brochure). This elegant Georgian house, after period restoration, displays a growing collection of heritage material associated with James Clerk Maxwell, his associates and family circle. from all over the world to meet in seminars, symposia, workshops and courses. To display the history of Maxwell's family and his many technical advances, as a simple museum, within his birthplace. To develop programmes to encourage young students to become mathematicians, scientists and engineers. Research and travel grants are made to young scientists. James Clerk Maxwell prizes are awarded. technologies of today, e.g. through meetings, exhibitions, lectures, and cultural events. 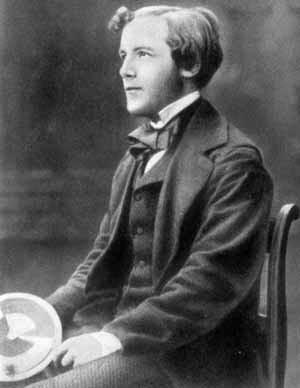 We welcome you to our web site and invite you to explore it, we hope that you will find something of interest about James Clerk Maxwell - The man who changed everything. That this House welcomes the unveiling of a statue to the great Scottish scientist James Clerk Maxwell, taking place in George Street, Edinburgh on 25th November 2008; recognises that Clerk Maxwell is one of the most influential scientists of all time, his discovery of the nature of electromagnetic waves paving the way for radio, television, radar and the mobile telephone; congratulates the Royal Society of Edinburgh and the many donors who made the monument possible; believes it is right there should be public recognition of the achievements of Clerk Maxwell in the city of his birth; and hopes that wider appreciation of the works of great Scottish scientists and engineers will inspire new generations to seek to follow in their footsteps. click here for further information about the special events held in his honour during Maxwell Year 2006.